As part of our quest to continuously improve, we’ve dug deep into the heart of what we have to offer. We’ve transformed the look, feel and functionality of our website to serve you better. We’ve set out our Mission, Vision and Values and everyone at Magnacom is committed to upholding them. We’ve strategized for your success—offering everything from adaptable service packaging to our customized client log-in—and you’ll find all the details here, on our new website. 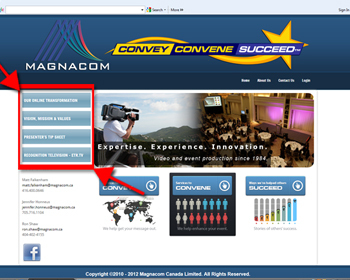 Magnacom is a company focused clearly on the client, and we dedicate ourselves to outstanding service. According to founder and president Ron Shaw, "We've honed in on what it means to offer our very best, combining expertise and experience with innovation. The world is changing at a rapid pace and we’re committed to keeping up with the latest technology and strategy to ensure our clients’ success. We feel our new website truly reflects this new direction of our company." Our services extend into almost every area of video and event production. 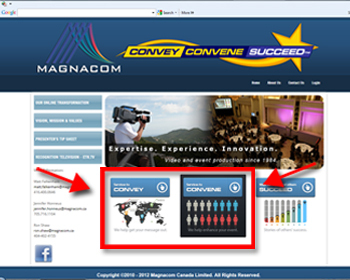 You can find a comprehensive list of each service under our “Convey” and “Convene” buttons on the homepage and these can be transformed into the package that’s right for you. 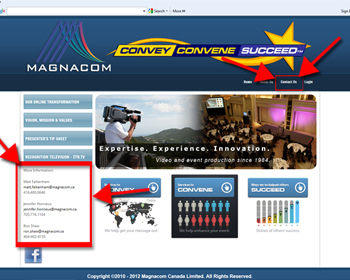 You'll also find success stories on the "Succeed" button, just right of "Convey" and "Convene." Here you can see how we've helped others succeed and get ideas on how to put our services into action. The list will be updated regularly so you'll have a full archive of idea-generating success stories. You’ll find our contact info on the bottom left, or you can click “Contact Us” on the top right and send us your information. Someone will respond within 1 business day to answer any questions. 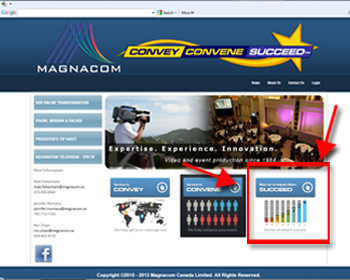 Our “Featured Links” section keeps you current with everything from Magnacom’s latest happenings to relevant industry information. You’ll even find handy tips here, such as our “Presenting Your Best” PDF—we do everything we can to support your success. 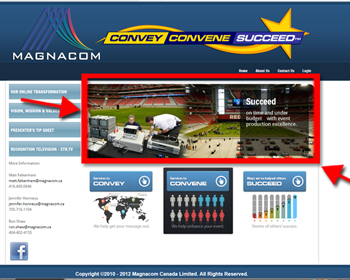 Finally, our “Convey, Convene, Succeed” banners will feature a different service each month, as well as client success stories. 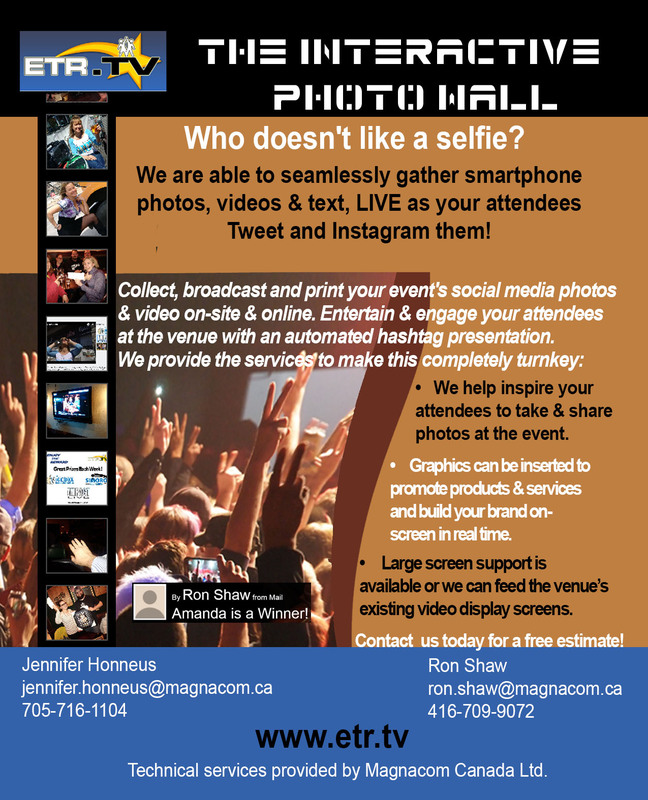 Here you can get ideas for your event and video projects. Have a look around and let us know what you think. We welcome your feedback and we look forward to your continued visits! Special thanks to Jenny McKaig for content creation; Josh Pietras, photographer, for layout and design input; and Chris Coltman, Elyptic Production, for design and technology authoring. We help you convey. We help you convene. Most importantly, we help you succeed.